The drainage rush is in full-force. It’s time to take stock of your drainage equipment. Do you need an upgrade to keep up with demand? Timewell is offering both new and used commercial drainage plows with a specialized design you can’t get anywhere else. Several styles are available including new Super 685HD and used Super 600 models. Contact your local territory sales manager to get details about current machinery inventory. Research and development conducted with RWF Bron has yielded a high performance drainage installation machine: the Super 685-HD Power Unit and the DL850 Double Link drainage plow. The new design received several upgrades over previous models and features the latest technology for productivity and safety. The Super 685HD is raising the bar on drainage plow quality and performance. What does this design mean for you? The Super 600 is customized for the experienced commercial drainage contractor. This machine has been modified to save you time and money in the field. 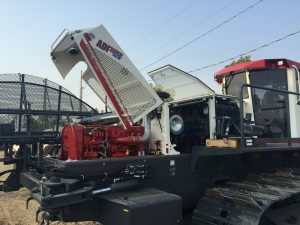 Not only do we offer state-of-the-art self-propelled drainage plows, we also have new and used replacement parts and all the support equipment you need to make your business successful.